Should I keep my child’s adoption a secret? This is a question we hear often from adoptive parents , and understandably so. Up until the 1970s, it was common to keep adoptions a secret from both the child and society. It was a secret that was kept between the parents, and one that they went at length to maintain. Fortunately, since then, there’s been a shift away from secrecy. In fact, according to Child Welfare Information Gateway, since 2012 only 5% of adoptions have been completely confidential or closed. This means the large majority of placements are open or mediated. This also means there’s been a positive shift away from the pre-70s secrets. Studies show that openness in any form has many possible advantages for both the adoptive parents and the child. 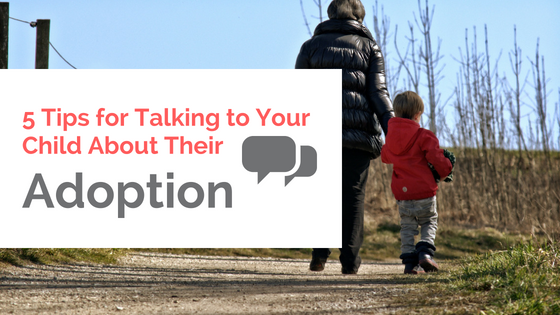 So, how do you discuss adoption without making alienating your child? Not to worry. This is a tough journey for adoptive parents to navigate, but with these 5 tips for talking to your child about their adoption you’ll decrease overwhelm and increase love. I bet you can remember every detail of the adoption process. From the first conversation with your partner or family members, the long nights of research and finally to the day you met your beautiful child. Sometimes after the adoption is officialized, all you want to do is look forward to the future and not dwell on the process that preceded. However, the steps you took are just as important to your child as the adoption itself. 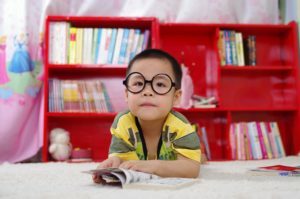 Create a narrative by telling your little one or teen the story of their adoption. By telling it as a story, you create feelings of normalcy, openness, and appreciation. Something fun we’ve seen parents do is creating an actual book (either scrapbook or picture book) that illustrates the miraculous journey. It’s also an amazing way to share your experience curious friends, family members and, acquaintances. This is a gift that should be shared with the world. Timing is everything, which is why adoptive parents always ask, “When is it a good time to talk to my child about their adoption?” The answer may come as a surprise. –> When you start sharing at a young age, it gives you time to become comfortable with transparency. By the time your child is old enough to understand, you’ll have no problem communicating with them. 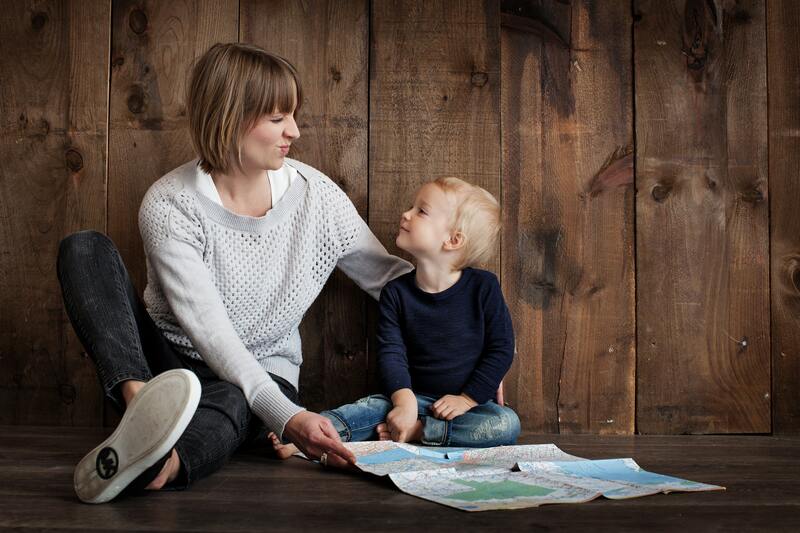 –> The sooner you narrate, the faster you’ll create normalcy and comfort the idea of adoption for your child. –> It’s a great way to emphasize the excitement and gratitude that surround them being in your life. It’s always a good time to talk about how you came to form a family. Although tip number 2 says that you should discuss adoption right away, how you discuss it will change over time. If your child is under the age of 5, it’s not necessary to share every detail about their birth parents, especially if they have a harrowing backstory. Instead, talk about the basics. We suggest using pictures and picture books that depict the story of their life or of the adoption process in general. Save the grueling details until you feel your child is mature enough to digest and understand the information. Not sure if your child is mature enough? If they’re asking specific questions or giving you cues of curiosity, it’s time to divulge more detail. Speaking of your child asking specific questions, it’s extremely helpful if you prepare for these hard-hitting inquiries ahead of time. First and foremost, you must mentally brace yourself, as some of these queries may cause you discomfort or pain. It takes time to train yourself to take these questions as a form a curiosity, and not an attack on you as a parent. Asking about birth parents is not a sign that they’re not happy with you, but for some adoptive parents, that takes time to recognize. Second, make it known to your child that it’s okay to ask. Tell them often that they can request any information from you, and prove that it’s acceptable by giving them an honest answer. The questions will never end. Although you’ve told the story of their whole-hearted homecoming and answered a tough question or two about their birth parents, it’s important to know that it doesn’t stop there. The conversation about your child’s background should start when they arrive home, but never end. Don’t view it as “the talk” rather, see it as “the lifestyle.” As we’ve mentioned several times before, what’s most important is that normalcy and openness surround the adoption. The more you talk about it, the more natural it becomes. If you remain open, forthright, and loving, there’s nothing to fear about talking to your child about their adoption. The child you spent months, if not years researching about and hoping for is now in your arms. The adoption process is a miracle, and one that should be shared with anyone willing to listen. Keep the secrets in the 70s, and instead opt for honesty.